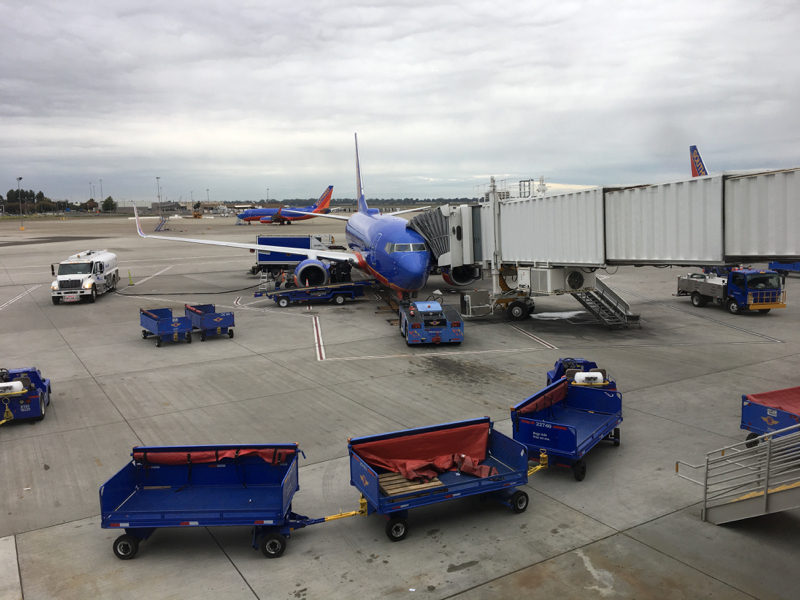 I’m off and up out, but got to the airport early so here’s a quick post about Cafeteria 15L inside Terminal B of the Sacramento International Airport! Flying out of Terminal B allows some great food selection, including Burgers & Brew and Jacks Urban Eats. Today was the first time I ever tried Cafeteria 15L though. This is a satellite location of their downtown restaurant. I seated myself on the “patio” for maximum people watching potential. I was greeted within a minute or two and offered a coffee. They only have seven items on the breakfast side of the menu which include a waffle, a couple omelets, a breakfast sandwich and a breakfast burrito, which is what I ordered (egg, chorizo, potatoes and pepper jack cheese, served with salsa and guacamole)[$12.99]. Prices are typical for the airport, so about 75% higher than they should be. 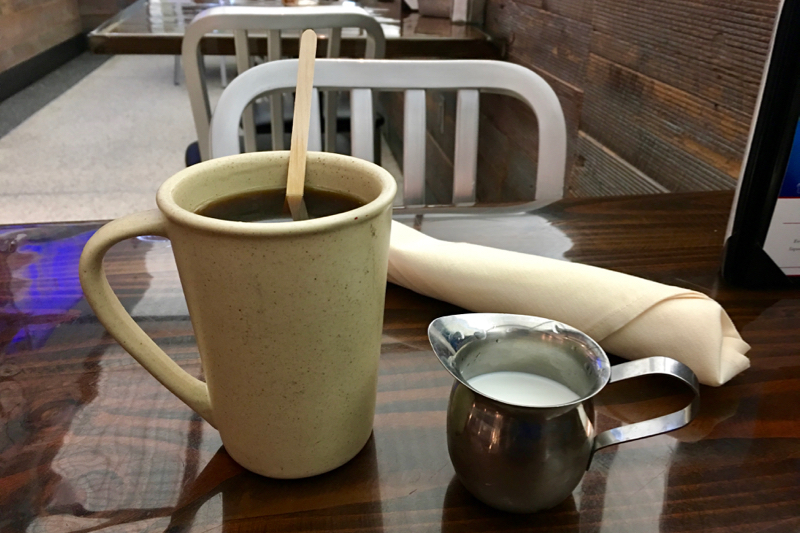 My coffee was piping hot and delicious. The burrito arrived about 7 minutes after ordering it. It was also hot and steaming. There was a small amount of a blended salsa and fresh guacamole on the side. The guacamole reminded me a bit of Jimboy’s guac. Fresh, but with an extra flavor that I’ve never been able to put my finger on. It is good though. Although this is not a huge burrito, it was packed tight with loads of eggs and chorizo. The potatoes were not in a huge abundance, which was fine with me (less filler!). The pepper jack was not very visible but I did taste its slight kick in most bites. The eggs were perfectly fluffy and the chorizo savory, tender and rich in flavor. This was easily one of the best things I’ve ever had here in the airport, and I will definitely be checking out more in Cafeteria 15L on future trips. 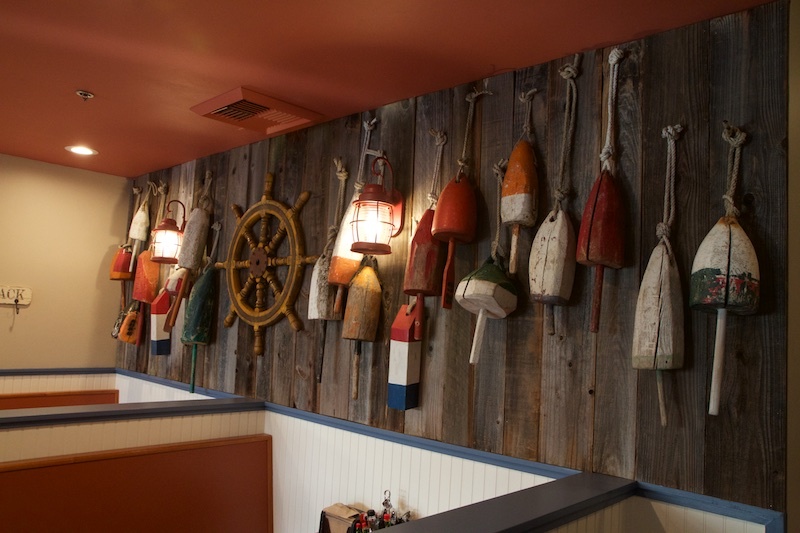 Tonight I went to the new Old Port Lobster Shack. They soft opened about three weeks ago near Mikuni and Century 14 on Eureka. Soon they will have their full menu, but at the moment they don’t have beer or desserts (possibly a couple other items). I’ve been looking forward to this one for quite a while. I had thought this was actually a much more widespread business, but they only seem to have a few other locations; two in the bay area and one coming to Portland. I was joined by some family members a little after 5:15PM and we were one of the first customers for dinner. The three-person staff were very friendly and greeted us right away. The menu is on a chalk board to the let when you walk in. I have been curious about what the prices would be like. 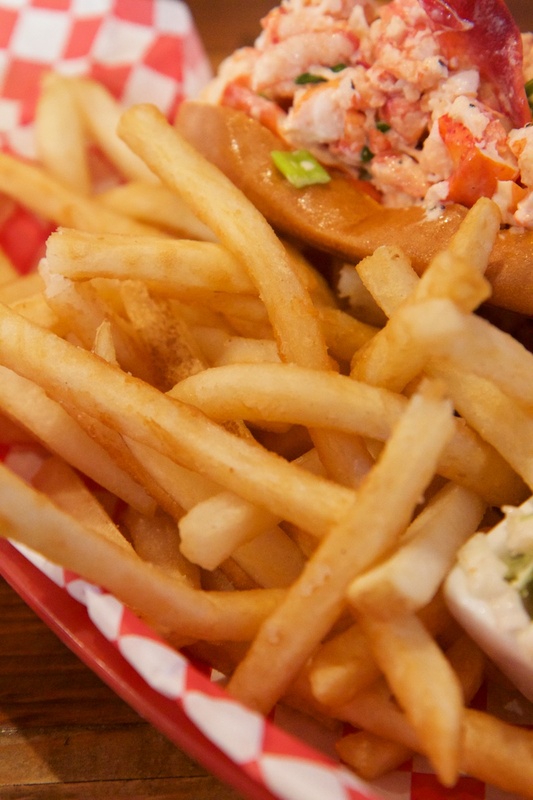 My only experience with lobster rolls has been from various food trucks, and they tend to charge about $15-$17 for a small roll. I was a little taken aback when I saw that their rolls were $24.75, but I had to see what it was all about here. 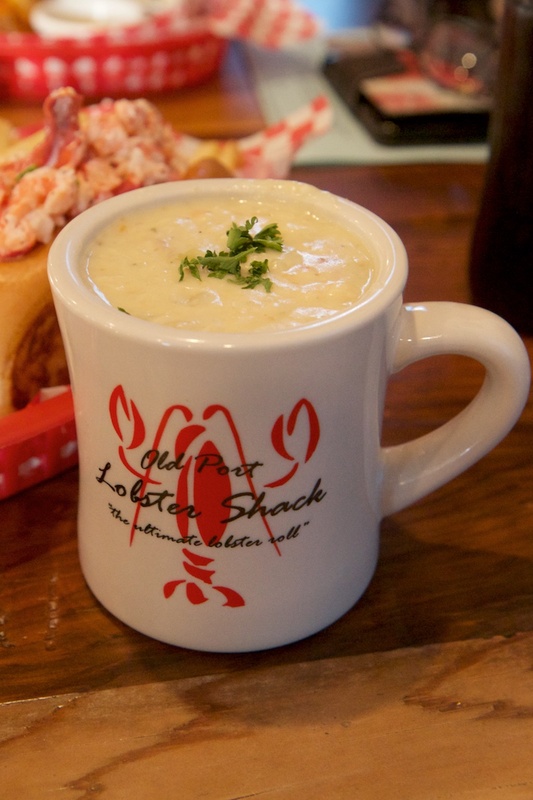 I’ve recently been hankering for some clam chowder, so I also ordered a cup of that [$5.75]. 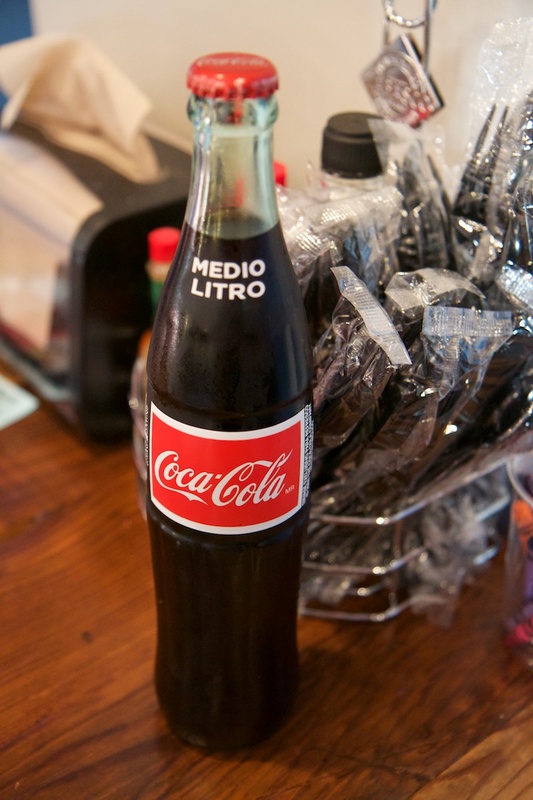 A bottle of Mexican Coke finished off my order [$2.50], bringing the total with tax to $36.28. There are lots of less expensive items to choose from. Pretty much everything with lobster (except the bisque) is going to set you back $25 though. We took a seat in the dining room and didn’t wait very long, less than 5 minutes, for our food to start coming out. For the rolls there were two choices, Naked and Maine. 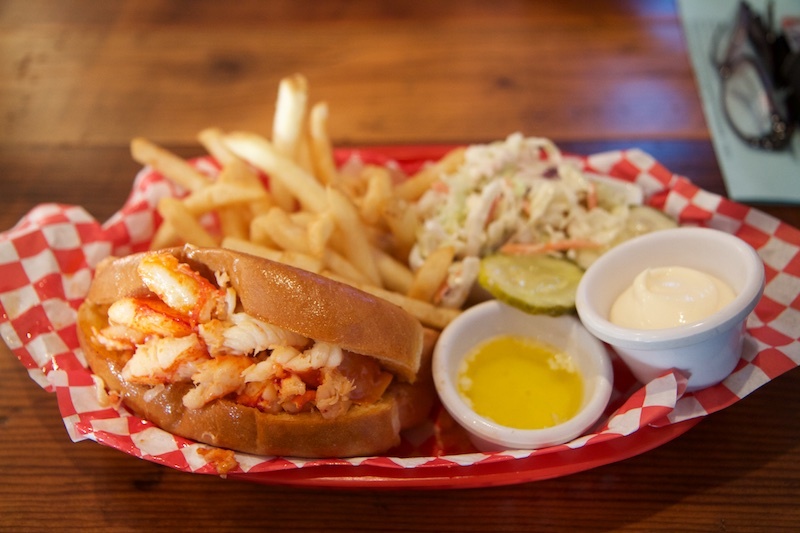 The Naked was just lobster with butter, served cold or warm with sides of mayo and warm butter. The Maine was served cold, mixed with Hellmann’s mayo, green onions, salt & pepper. Both were serve with fries and coleslaw. The slaw was fairly sweet and had some raisins mixed in. 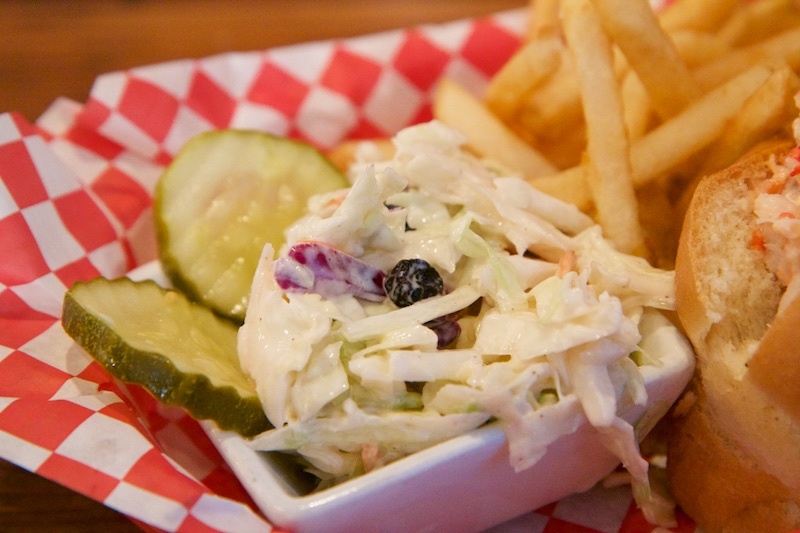 I’m not really a coleslaw guy but I’ll usually eat it anyway. I thought it was fine. The fries were good, crisp and hot. They didn’t need any salt or ketchup; a great fry in my book. 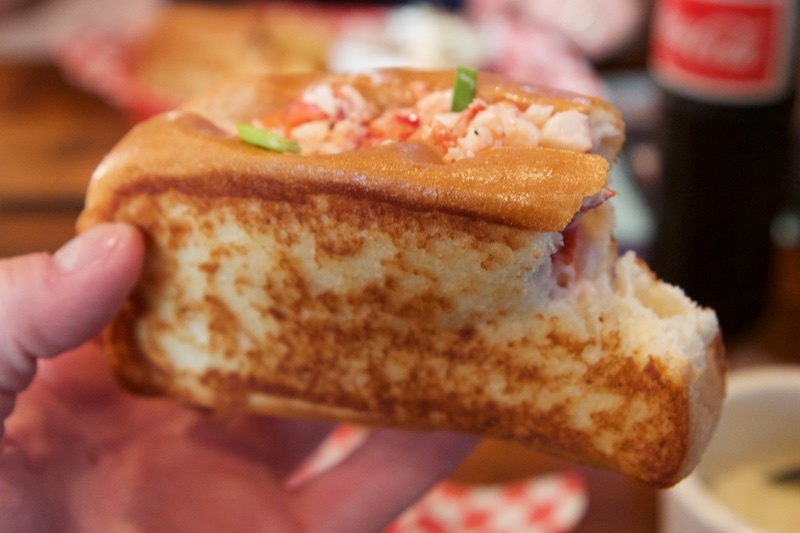 The lobster was served on a soft, buttered and toasted roll. 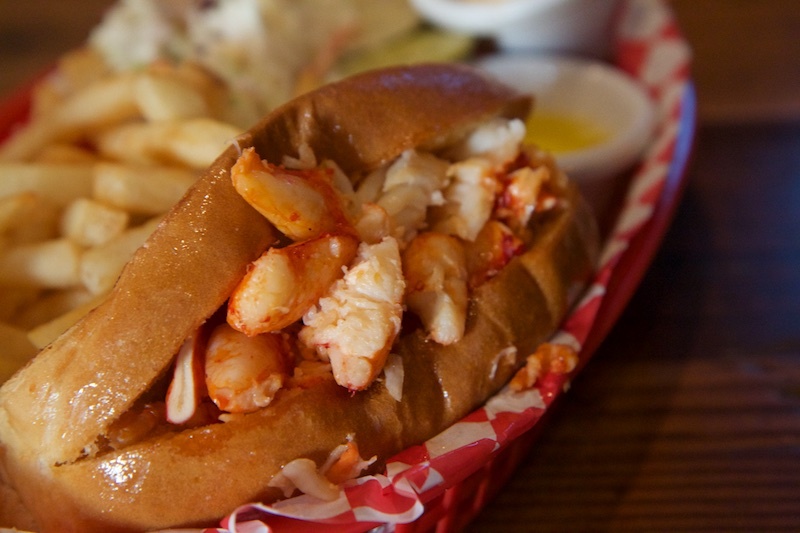 Based on memory, I would say there was about 50% more lobster on these than on the rolls I’ve had from trucks. The naked roll was pretty straightforward. I had the Maine roll and it was very good. The mayo, very light amount of green onions and salt/pepper seasoning helped transform it into something a little more interesting and tasty. My cup of chowder came out in a literal cup. It tasted pretty good, but unfortunately was not very hot. 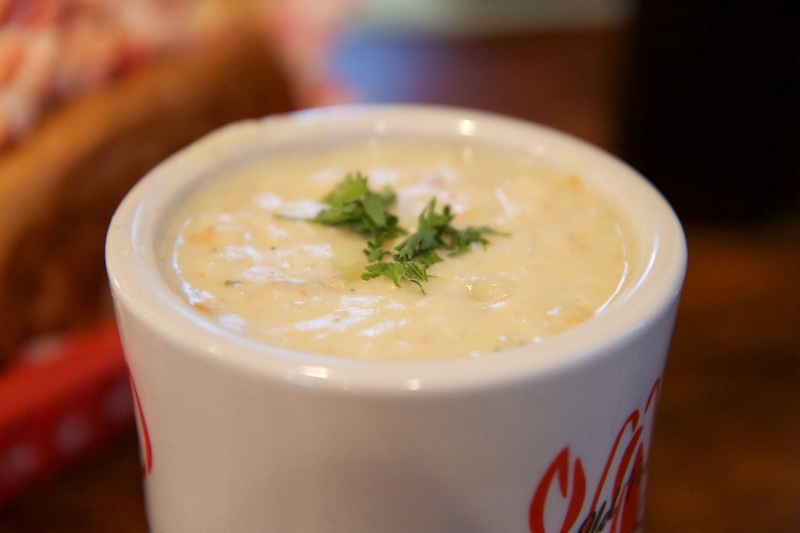 The clams were small but plentiful, as were the potatoes, which made it a somewhat smooth chowder. I think if this were hot it would have been much better. 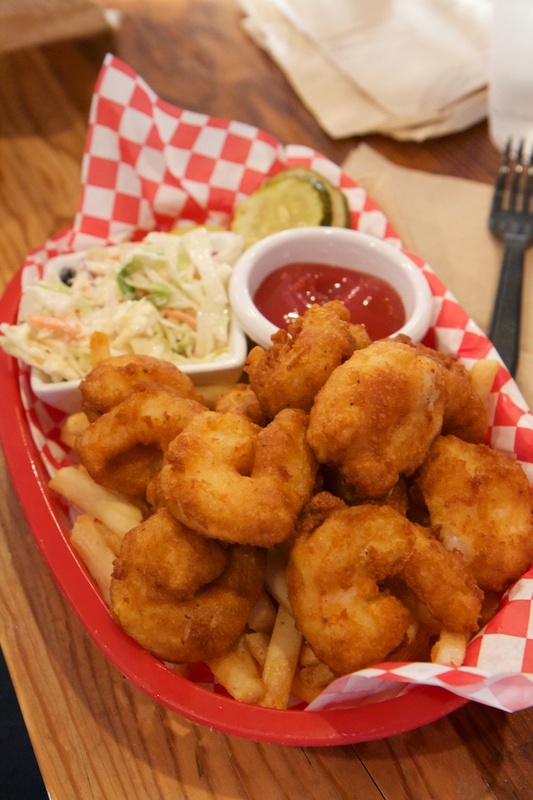 The last item we had was a basket of fried shrimp [$13]. This also came with fries and coleslaw. I think this was the absolute best value of everything we ordered. It had a ton of giant shrimp that were delicious. They had a light batter to them and it came with lemon slices which added some nice bright flavor to them. Admittedly, lobster is never particularly inexpensive. Still, I find the price to be a big downside and tough to justify when you can get tons of great food for much less than I spent on my roll & chowder. 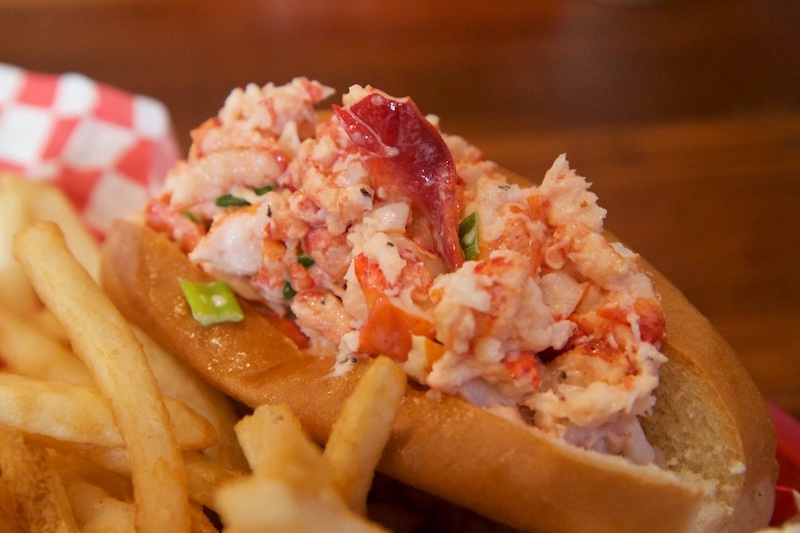 I’ll really have to be in the mood for lobster to return. That said, the food was good (chowder temperature aside), I cannot deny that. It’s worth a visit, even if it’s not going to be a place I expect to frequent. Last Thursday I was joined by some family members for dinner at the new Sienna restaurant. Sienna is located in the old Crush 29 spot on Eureka and Rocky Ridge. 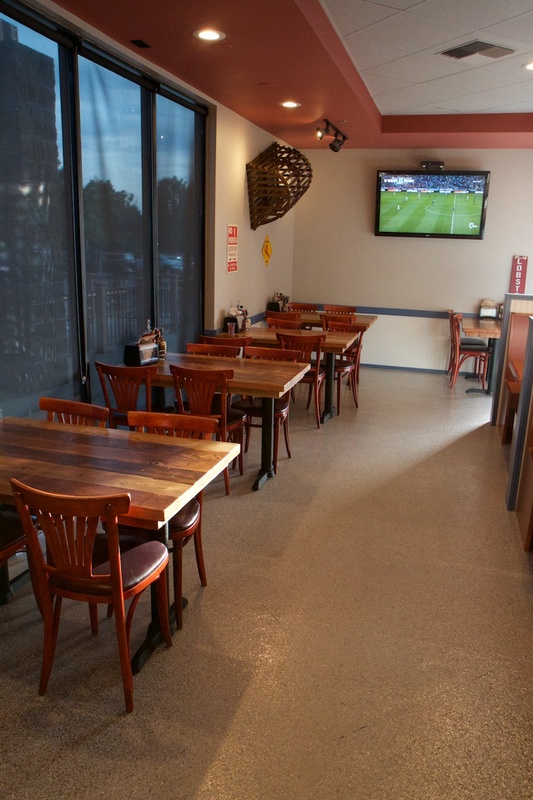 This Roseville location is their second, with the original in El Dorado Hills. Sienna is by the same people that brought us Land Ocean around the same time last year. I rolled in just before 6PM and the parking lot was packed. I made one pass through the front lot and decided to just valet it (complimentary, + tip of course). My family had found parking in the back, which I actually didn’t even realize existed. They saw my car being parked as they walked around. In front to both the left and right is a good amount of outdoor seating to enjoy drinks (maybe even some happy hour appetizers? Not sure if they serve food out there) with dual fire pits on each side. I walked inside to put our name in incase there was a wait. It seemed busy, but that was mostly the bar. We were seated right away. The bar, by the way, had seen some work in the remodel. They removed the big round structure that hung from the ceiling and opened it up, which really helped make the place feel bigger and less cramped. There was still a good amount of light outside and the big skylights in the center area of the restaurant (mostly the bar) made it nice and bright until the sunlight faded over the next half hour. The nicely-bound menus almost feel like they give a nod to Crush 29 with a similar metal inset on the front, featuring the restaurant name punched into it. We were sat near the right dining “wing” in a booth that bordered the bar area and were soon greeted by our server, Jordan, who ran down a couple specials and let us go over drinks for a bit before he returned. A bottle of Stellina di Note, a Pinot Grigo [$30] was ordered for my mom and grandma, my dad had a glass of Montevina Barbera [$8] and I ordered the Vanilla Old Fashioned (Vanilla bean infused Bulleit bourbon, vanilla simple syrup, luxardo cherry juice & cherry bark bitters)[$12]. The wine came out first and the bottle was placed in a chiller at the edge of the table. My old fashioned came soon after. Jordan toasted a slice of orange peel briefly with a lighter before dropping it in the glass and then serving it to me. It added a really awesome aroma. The drink was chilled with a single, large sphere of ice. A small black cherry on a pick garnished this drink alongside the peel. I ended up giving that to my dad later and he loved it. This drink was fantastic and had a perfect blend of vanilla and bourbon flavor to it. It was also incredibly smooth. Jordan said he hadn’t tried it yet but it was on his list. I told him to move it to the top. Along with the drinks we received a plate with some tasty warm bread and soft butter. We also had an appetizer, ordered at the same time as the drinks, which arrived just a minute after my old fashioned. This was the Shrimp & Bay Scallops Ceviche (Tequila-lime sauce, fresh avocado, micro cilantro & house made tortilla chips)[$14]. This was very good. It was a bit top-loaded with shrimp, scallops and avocado however. Below the top layer it was filled in with a fair amount of lettuce. We did find more bits of the best stuff down towards the bottom of the glass though. The chips were warm and fresh. Our entrees arrived all together about 15 minutes after the ceviche. My grandma had the Pepperoni & Sausage wood stone flatbread (housemate marinara, crimini mushrooms & sweet red onion)[$15]. I had a piece of this and it was tasty. The bread was toasted just-so on the outside and bottom, leaving the middle nice and soft. The toppings were well portioned and flavorful with a dusting of parmesan on top. My mom ordered the Pepper Steak Campanelle Pasta (sautéed tenderloin, crimini mushrooms, fresh tomatoes, parmesan cheese & brandy peppercorn sauce)[$20]. I had strongly considered this but went with another choice. It was served in a rectangular dish, garnished with green onions and came with a couple slices of toasted bread. I had a bite of the tenderloin and it was very nice. The peppercorn sauce was front and center, but not to the point of masking the flavor of the beef. My dad got the Grilled Prime New York Steak (10oz sliced, garlic-parmesan whipped potatoes, sautéed green beans, sriracha butter & onion strings)[$35], medium-rare. This was neatly plated with the asparagus perched atop the potatoes and topped with the onion strings. The sliced steak rested up against this arrangement. It was cooked nicely, with a little bit of a red center and lots of pink around that. The piece of this that I tried was very good, nice and tender, but I think mine was even better. For my order I went with the Frilled Filet Mignon (boursin gratin potatoes, balsamic pancetta, brussels sprouts & asparagus)[$34], also medium-rare. It was a thick cut and done perfectly. Actually probably more on the rare side, which is fine with me. Lots of red throughout. This was fantastically tender and practically melted in your mouth. The balsamic pancetta reduction was flavorful but did not in the slightest way cover up the filet mignon. The veggies were really interesting in that they were not cooked to the point of being soft or mushy, but actually still had a significant raw crispness to them. The brussels sprouts and asparagus were incredibly flavorful. Part of this was due to thick, crispy bits of bacon mixed in. I thought that would do it for us, I was slightly full, but then I saw a shallow dish, what looked to be creme brûlée being delivered to another table. I knew what I had to do. We got the dessert menu, a mini-version of the dinner menu, and perused the options. My parents decided to each get a port, the Warre’s “Otima” 10 Year Tawny [$8.50] and the Terra d’Oro Zinfandel Port [$8]. Each of these were incredible. My Vanilla Bean Creme Brûlée (fresh berries & white chocolate shavings)[$9] took an unusually long amount of time. As I was looking at my camera photos to get a sense of how long it had been and realizing we were coming up on 30 minutes, the manager herself delivered it just then and apologized for the wait and let us know that it would be on the house. This was a nice finish to dinner. It was a bit less dense of a custard than most, but had a good vanilla flavoring to it. Overall, despite the hiccup on timing for the dessert, I thought this was a great dinner. Everyone very much enjoyed their food and Jordan did a solid job. Ambiance was nice, but it did get a bit loud as the restaurant filled up. The complimentary valet is a nice convenience. When this space was vacant the parking situation was much better, but it’s probably going to be a challenge to find a spot in the front on the weekend evenings again. If I remember correctly, Crush also offered valet. I am definitely interested in coming back, especially to check out the happy hour offerings and sit on the patio out front.